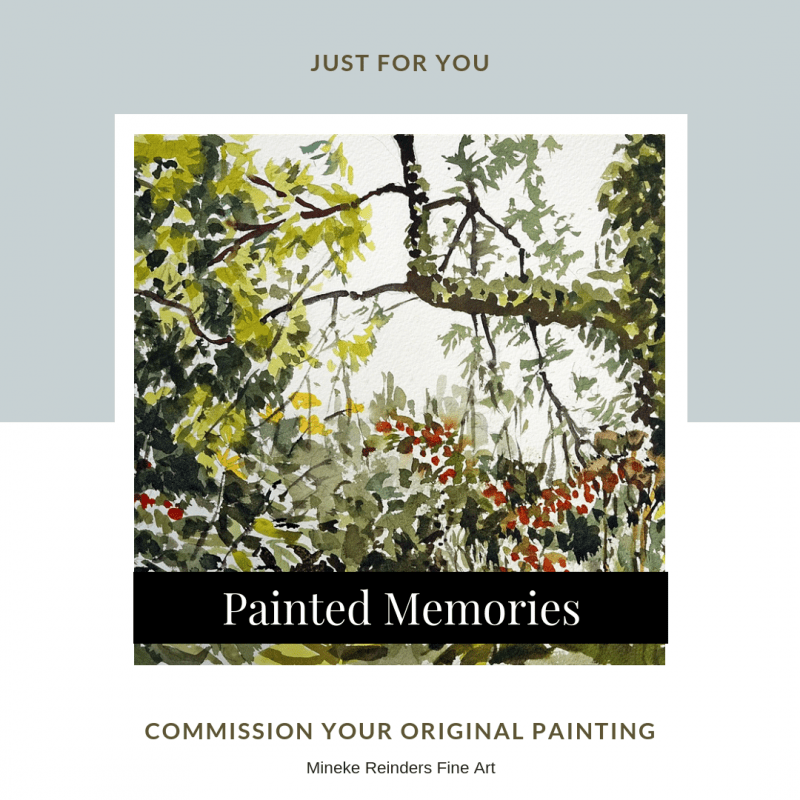 Are you a plein air painter? When I first started painting about thirty years ago, that was a question nobody ever asked me. Even when I was an art student in the early nineties, it wasn’t a subject that ever came up. How things have changed in the world of art-making! Plein air is a big thing nowadays, both as an art movement and as a booming business of events, competitions, and conventions. I admit I was slow to embrace plein air painting, for several reasons. One reason was simply that I enjoy the comfort and solitude of the studio. No nasty weather conditions, pesky bugs, or inquisitive bystanders to worry about. Cups of tea and coffee at hand, music on the stereo – or later on any number of playlists. Another reason was that subject matter matters to me. Why should I go out to paint subjects that I couldn’t muster a lot of enthusiasm for when I had an extensive archive of digital photos from places I had lived in or visited, that held more meaning for me? I had no trouble remembering those scenes vividly, putting myself there again in my mind while painting them. I also never felt tempted to merely copy photographs (and am well aware of the dangers of that), but rather let them inspire me to paint the spirit of those remembered places. I still feel the same to a large extent, but at the same time I’ve come to appreciate the advantages of painting on location, which are very difficult to achieve in the studio. For the past two summers, I’ve participated in Summer Art Event, a plein air paint-out weekend in my area, and found it energizing and a lot of fun. The inconveniences of painting outdoors even add a bit of urgency to the experience, which somehow directly transfers itself to the painting. Perhaps this is what constitutes that plein air magic to which so many painters are addicted? I think there is a downside to the plein air craze, as well as an upside. The downside is that a lot of plein air work looks the same: painters go to a lovely spot in nature and paint pretty much what they see there. The upside comes from those painters who not only master their craft, but also have a personal vision which comes through clearly in their work. When you look at such paintings, it’s as if you’re instantly transported to the spot where the artist stood when they painted it, and you see it through their eyes. No photograph of the same spot at the same time could convey that sense of being there in the same way. My hat is off to those masters of plein air, and though I won’t be joining them regularly – I’m still attached to my studio environment and all of the memories I captured in photographs over the years – I do intend to venture out of doors more often and try to capture something of life in the moment. 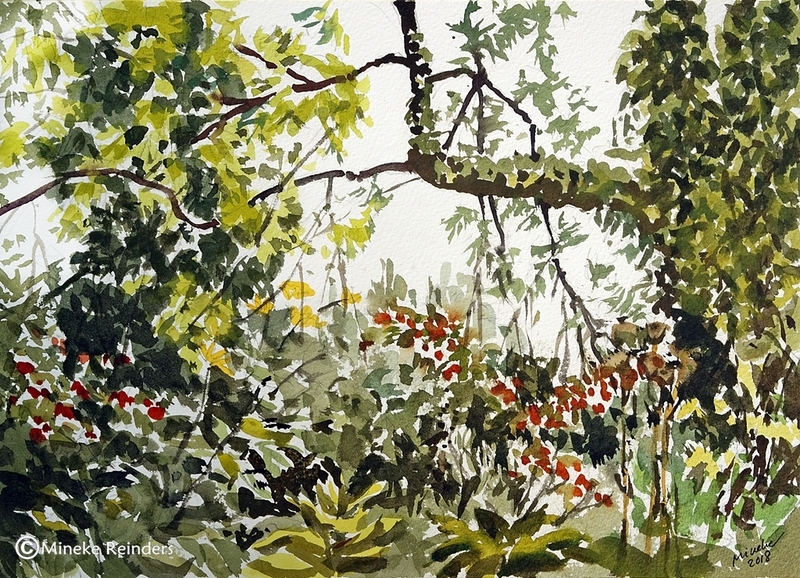 The watercolor above is the result of a – for me – rather daring endeavor of taking my painting gear outside to paint: literally in my backyard 🙂 Visual preservation of things and places that are fragile and endangered is a recurring theme in my work, and this watercolor was also motivated by my need to capture and preserve something of a place I loved, which was destined to disappear. I walked by this community garden every morning, and the day I took my painting gear outside to spend a few hours recording my joy in this piece of urban wilderness was definitely a morning well spent. The holidays are upon us… I hope you consider giving something hand-made. You can support artists and crafts people everywhere, and give your loved ones something truly original! Besides my original watercolors and mixed media pieces, my illustrated birthday calendar would also make a lovely Christmas gift. If you’d like to commission a special piece for someone else or yourself, let me know what you have in mind, and I’ll tell you if it’s something I can do. 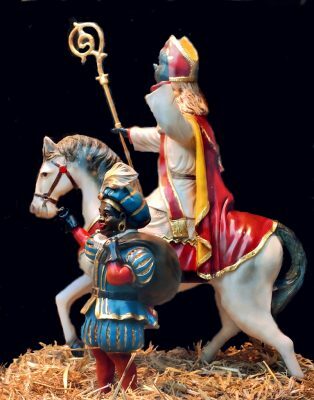 Have a wonderful December, and to my Dutch friends: Fijne Sinterklaas! This entry was posted in plein air, Uncategorized, watercolor, watercolors and tagged urban, wilderness.